October is National Bullying Prevention Month. It’s a time when parents, educators, and their community work together to raise awareness about bullying, and the negative impact it has on students. Since children are inspired by their favorite superhero, this is the perfect theme to incorporate into your bullying prevention program. 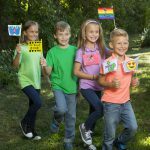 They understand the difference between heroes and villains, which will help teach some important lessons when it comes to bullying. Here are some activity ideas for your classroom or afterschool program. Draw a chart on your whiteboard, message board, or poster board with Villains written on the left, and Superheros on the right. You can also write the word “bully” under Villains, but cover it with a piece of paper. Have students think of words that describe villains. When they raise their hand and say the word, write it under that column. Many common characteristics they think of are evil, mean, violent, and scary. Now have them raise their hands and say words that describe superheros, and write them under that column. They will say words like strong, helpful, kind, and brave. Now ask them which they’d like to be, a villain or superhero? Reveal the word “bully” under villains. This is a perfect way to lead a discussion about bullies and how they make others feel. A bulletin board can really set the tone for learning and create a positive environment for both students and teachers. For Bullying Prevention Month, a superhero bulletin board like this Superhero City Scape Bulletin Board Set is a great way to encourage your class to show their inner super hero qualities. You can also use it for interactive activities. One example is called Superhero Behavior. Write the words “Superhero Behavior” on two of the cloud labels and put them at the top of the bulletin board. With the class, discuss what a person can do to be considered a superhero. Does it have to be someone who can fly or fight crime, or can it be someone who is kind, respectful and helpful of others? What would a superhero do in the classroom? Brainstorm ideas and write the ones the class likes best in the blank thought clouds and speech bubbles. Post these on the bulletin board and refer to them often to encourage superhero behavior. When you notice a student acting like a bully, refer them to the board and be interactive with them. Ask them if they are portraying the behavior of a superhero. Point to a word on the board such as “respectful” and help them come up with ways they can be more respectful to their classmates. You can also use this Superhero Bulletin Board Set to add to the superhero theme. By displaying the title “Our Super Class”, the students will want to strive to be the best and live up to the title. Choose one student per week to be featured in the Super Student area based on a good deed or something positive they did, like giving a compliment to classmate or using encouraging words to help build another classmates’ self esteem. When you highlight them for positive behavior it encourages them to be positive and strive to be the best person they can be, and sets an example for other students. This helps prevent bullying. 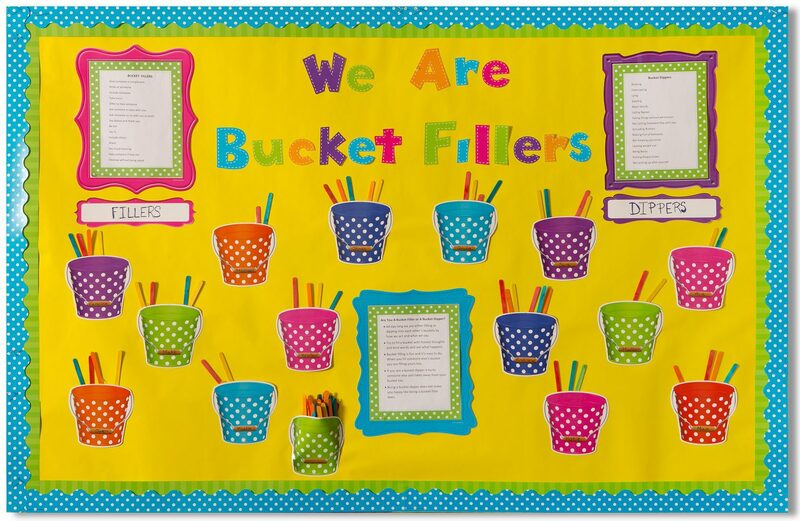 A Bucket Filler board is great for this concept too. Another way to encourage positive behavior is to reward students and make them feel proud. Give out Superhero Awards to students that have shown super qualities. For example, if a student shows they can be a positive role model, exhibits kindness to others often, or if they help a classmate that is struggling. You can even put these up on the wall in the classroom to display. Our Superheroes Pack is also great for highlighting superhero birthdays and giving out stickers and bracelets for being kind and respectful. This is a fun activity where students can express who they are, and share it with the class. Each pack has 32 posters, so each student can make their own. 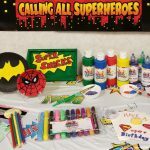 By helping the students get to know each other and relate to each other using a superhero theme, you can help foster a safe, positive, and comfortable environment in the classroom. Students will fill in the information about themselves, like their age, birthday, and what super power they would choose! Then they can draw what they like to do for fun. Have students pair up in groups of 3-5 and share their posters. This will also help them build friendships. 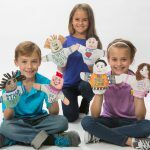 Crafts are a great way for students to express their creativity and bring their superhero ideas to life! Have each student create their own superhero cape with fabric markers, paint, or stickers. You can have them design the cape in many different ways, such as what superhero they would be, like a Fantastic Friend shown below. You can also make an activity out of it by having them think of one word that starts with each letter of the word hero, like Helping Everyone Respect Others. They can also add masks, shoe wings, and wristbands as accessories! Then have them design their own superhero shield, and with their super powers they can “shield out bullying” with the 6 pillars of character; trustworthiness, respect, responsibility, fairness, caring, and citizenship. 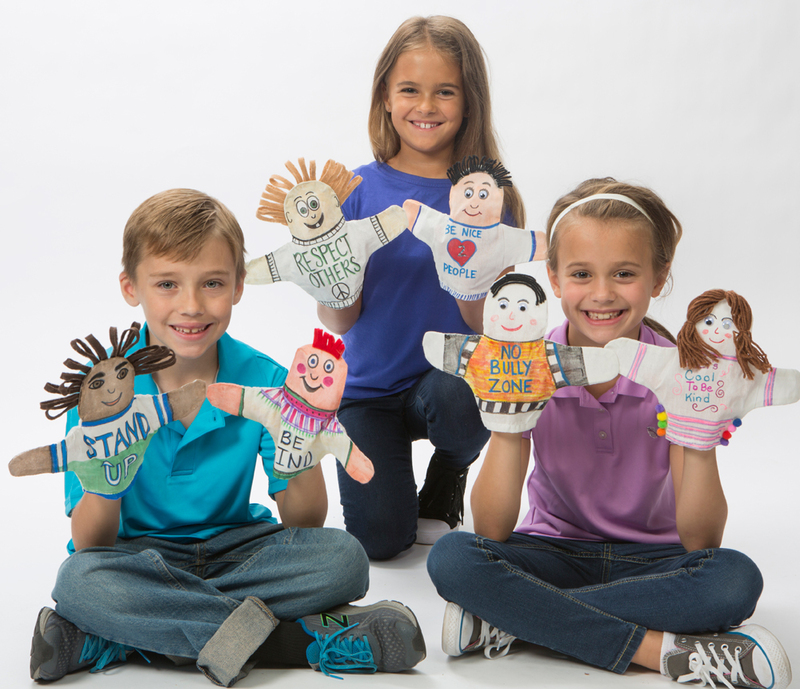 Tell us what works in your classroom for Bullying Prevention Month! Together, we can help stomp out bullying. This entry was posted in Education, Social Emotional Learning and tagged 6 pillars, bully, bullying, bullying prevention, classroom, crafty kate, students, super hero, superhero, superheroes by S&S Worldwide. Bookmark the permalink.